It’s ages since I linked up with Paint Party Friday. Health issues and family concerns have gotten in the way of pretty much everything. But a New Year brings with it a new dawn. I’ve been steadily scribbling away in my notebook and have come up with lots of new ideas for getting creative in 2019. Here’s a mandala I’ve been working on, it’s far from finished, but I hope you like it. I’ve drawn this with my favourite medium - ink. I love the simplicity of working with ink. All you need is a pen and some paper. I’ll be writing more about that in a future post. That’s all for now, have a great weekend everyone. Ohhh John this is simply beautiful. I am sorry about the health issues and you taking a tumble. Hoping you are feeling better and life is good for you. Hi, Nicole. Thank you very much. This time of year is always a challenge for me. The cold weather upsets my asthma and it makes my pain seem worse, too. But, hey, it is what it is. Roll on Spring. Hi,Valerie. Thank you for your kind comment. Very much appreciated. I hope as the time goes you continue to get well. 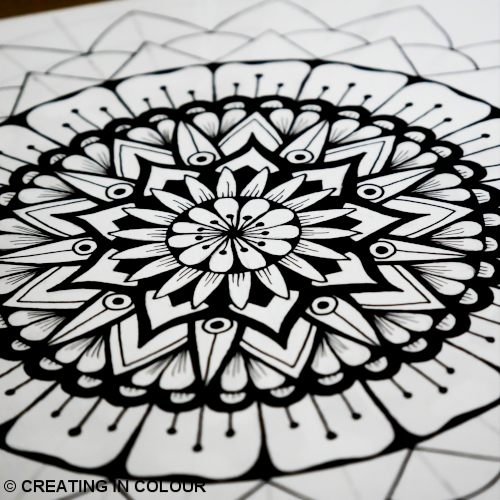 This mandala is simply stunning! I so admire your detailed and delicate ink drawings. happy PPF! Thank you, Linda, for your very kind comment. Oh, I think, hope, I'm over the worst. Hi, sirkkis. Thank you very much for your kind comment. Hi John, your work is detailed and intricate - it must be so peaceful as you create. Beautiful to see. Hi, Sue. Thank you for commenting. The main reason I got into art was dor it's meditative qualities. I find drawing like this extremely relaxing. Feeling much better now, thanks.